We recently ran a customer experience (CX) focused AdWords campaign and it amazed us how many people were searching for something like "tactics to improve Net Promoter Score" or "how to increase NPS in a restaurant?”. The questions suggest there might be an issue with the mindset of the people conducting the searches because improving NPS is not the same thing as improving CX. This is indicative of how CX has fallen over itself. Net Promoter Score (NPS) is simply a metric that gives an indication of what customers think about your business, but it is very easy to manipulate. Your frontline staff might be manipulating it by being selective about who is asked to complete a survey and who is not. I heard Ian Golding tell a story about a bank recently, where the bank was only collecting NPS data from customers who had been approved for loans. That is a great example of how a CX programme itself may be manipulating the result (they had an NPS of 81). Yes. You have to measure CX in some way to understand if you are improving things or making them worse, but setting out to increase NPS, for the sake of increasing NPS, is a deeply flawed strategy. Essentially CX is about people. The people receiving the service or product and the people that are delivering the service or that built the product. I was going to write an in-depth post about that, but I figured more eminent CX professionals have already said it better. 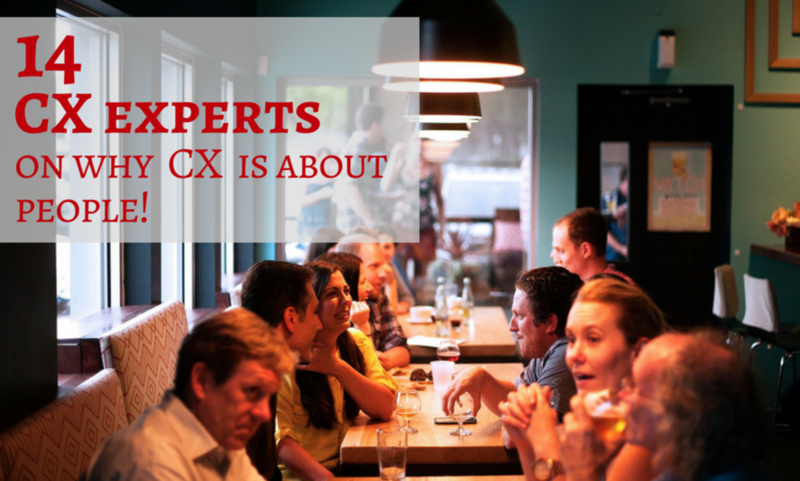 Below you will find some of my favourite quotes from CX luminaries that really spell it out loud and clear... customer experience is about people. "Operating based on personal assumptions – or my personal likes and dislikes – can be dangerous. What makes me happy or upset may not be in sync with how my customers feel. And when my assumptions don’t align with my customers’, it’s a potential customer experience disaster." "Customers don’t always communicate in an efficient way. An effective customer-facing professional is able to break this communication barrier to learn exactly what the customer wants. They do this by adapting their questioning, changing their tone or repositioning their questions. It’s a nuanced art which in my opinion, is also uniquely human." Also read: "Closing the Feedback Loop should be a Goal of Great CEM!" "We need to move away from process standardization and towards experience personalization. The only way we can do that is by starting to move away from segmenting customers by circumstance and towards categorizing customers by need." "Leaders get so far away from customers in so many organizations. Leaders can regularly assign tasks like calling support, visiting a storefront, or ordering online- to themselves and others. First-hand customer stories help others internalize what needs to change. More importantly, it helps them decide what to do about it." CX Consultant, Speaker, Author, Member of CXPA Board, Mentor, #CXChat Host, CEO at CXjourney Inc.
"Getting new customers costs 5-10 times as much as keeping the ones you have. It means never taking the real race—customer loyalty—for granted. Don’t rest on your laurels and fall asleep alongside the marketplace road and let the race be won by competitors who treat existing customers with the same care and attention promised to new customers." "Technology is not the magic cure for all of your service issues. While it is convenient for your guests to be able to request additional towels or a later check-out through an SMS message with the Front Desk, basic customer service traits like empathy, caring and understanding cannot be shared in a text message. It is and will always be the extra effort and commitment to providing your guests with a memorable stay that will make the difference."